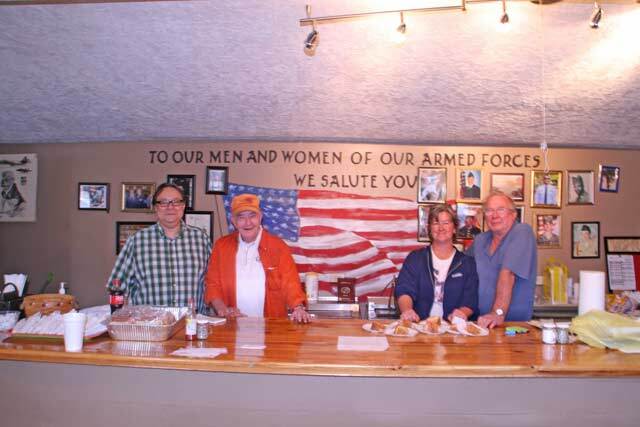 Pictured is the somewhat boisterous management and staff of recently opened CB’s Bar-B-Q. Left to right Lee St. Amand, Charlie Brown, Cathy Sprouse Cooper and Harvey Sprouse. Y’all pay attention now. Just down the hill from Oakley Park and directly across from Everett Keesley’s Automobile Sick Bay/Boot Hill is Edgefield’s newest opportunity to eat like a Southerner. CB’s Barbecue Joint is up and running under the direction of two of South Carolina’s most experienced chefs. Harvey Sprouse of Rib Eye’s fame and Charlie Brown of Six Points’ legend are serving barbecue chicken, hash, ribs, chipped barbecue and Harvey’s famous baked beans every Thursday, Friday and Saturday from 11:00 a.m. until 7:00 p.m. More importantly Mrs. Nita Bartley’s cakes are for dessert. Charlie advised me that all of the victuals offered, per the bill of fare, are prepared on site except for Miss Nita’s caramel cake. You can get a big old chip BBQ plate for a decent price or one of Harvey’s Rib Eye Steak Sandwich Plates for a little less. The absolute best deal I have seen in a long long time has to be a piece of Mrs. Bartley’s cake for just $2.00. Should you need to feed somebody like me, CB’s sells in bulk. A whole pound of BBQ Ribs sells for the same as a quart of hash. Speaking of hash it was comforting to learn that Lee is on the staff to handle quality control of rice preparation. According to the management you can eat in the dining room or out on the terrace or in your pick up truck or at home. It is really up to you. 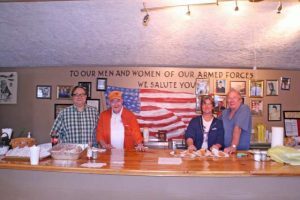 You are invited to add photos of service men and women to the décor of the establishment as hopes are to fill the walls with those who serve. Please keep the economic model of supply and demand in mind when it comes to Nita’s cakes, otherwise known as, get there early.